Manila, Philippines - “SANTI” has intensified into a Tropical Storm as it continues to move towards Luzon, PAGASA said in the latest weather bulletin as of 11p.m. today, October 9, 2013. At 10:00 PM today, the center of Tropical Storm “SANTI” was estimated based on all available data at 470 km East of Virac, Catanduanes (14.5°N, 129.0°E). Santi has a maximum sustained winds of 65 kph near the center and gustiness of up to 80 kph.PAGASA forecast Santi TS to move West Northwest at 11 kph. Tropical Storm or Bagyong “SANTI” is expected to be at 240 km Northeast of Virac, Catanduanes by tomorrow evening and at 230 km East of Baler, Aurora by Friday evening. By Saturday evening, it is expected to be in the vicinity of Dupax, Nueva Vizcaya. 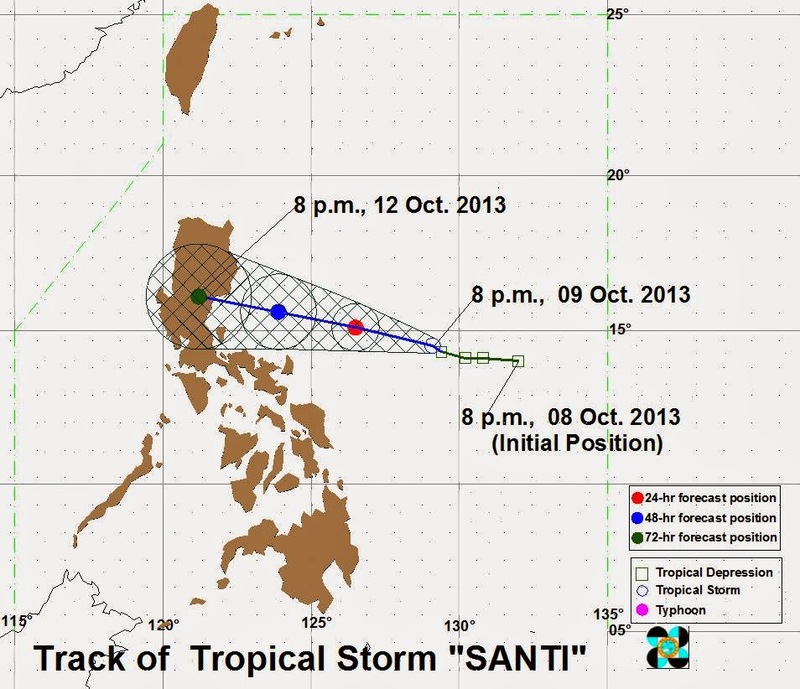 Signal # 1 (Winds of 45-60 kph is expected within the next 36 hours): Catanduanes. Estimated rainfall amount is from 5.0 – 30.0 mm per hour (moderate – intense) within the 300 km diameter of the Tropical Storm. Residents of areas under Public Storm Warning Signal # 1 are alerted against possible flashfloods and landslides.